Some years ago I was reading about the history of typography and the work of Paul Renner, the designer of the typeface, Futura. This description is from Wikipedia. Renner was a prominent member of the Deutscher Werkbund (German Work Federation). 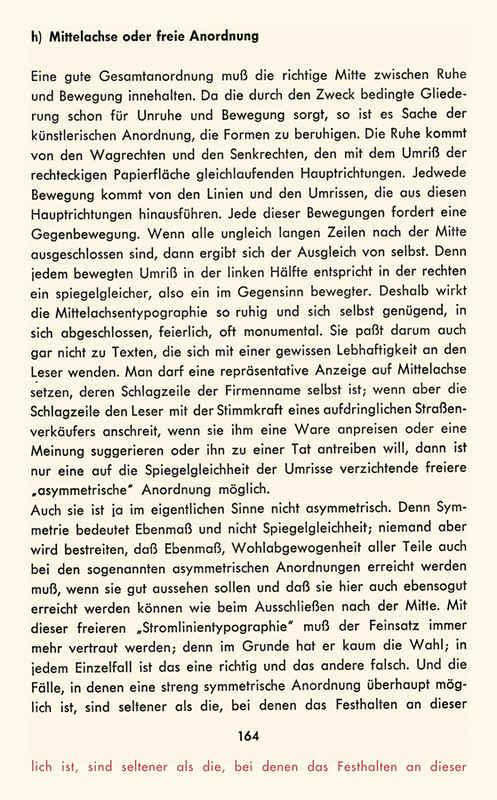 Two of his major texts are Typografie als Kunst (Typography as Art) and Die Kunst der Typographie (The Art of Typography). He created a new set of guidelines for good book design and invented the popular Futura, a geometric sans-serif font used by many typographers throughout the 20th century and today. I've always liked Futura. I especially love the round Os. It occurred to me that it might be interesting to buy Die Kunst Der Typographie and see how Renner himself used his Futura. I did buy it, and from the scan at the top of the text from one page, you can easily see that the letterspacing is incredibly wide by today's standards. Below the page number in red, I've taken the last line and reset it in a slightly lighter version. The next heavier digital size was too bold (or it might be my scanning or ink gain). word spacing is locked at 210%. By today's standards, the word spacing is wider than wide. The book was copyrighted in 1939 and printed in 1940. The page image above makes me wonder how often anyone has set the spacing that wide on literally anything printed since the introduction of the Macintosh. We will try it sometime. M i g h t b e f u n w h e n c o m p o s i n g s o m e m e t a l t y p e t o j u s t s p a c e o u t E V E R Y l e t t e r j u s t t o s e e h o w i t f e e l s . Y o u w o u l d n e e d a l o t o f t h e r i g h t s i z e d s p a c i n g m a t e r i a l .
Also, I'm wondering how this type would have been set for the book. It seems to me that the logical way in 1940 is either on a Monotype or Linotype machine. Is there a way on a Monotype to artificially widen the letters? There would have to be some way to do it automatically or perhaps reposition to matrices in a Monotype mold to push the widths a bit more every time. The following was taken from the Palomar Community College website. Less than a month after Tschichold's arrest and only seven days before the Bauhaus was raided, Renner was also taken into custody (and then released the following day after the intervention of Hitler's deputy Rudolf Hess, a friend of Renner's family). Soon after, the Nazis denounced Renner as "nationally untrustworthy." At 55, he was dismissed from his teaching post and forbidden to work at a regular job for the rest of his life. Renner survived this humiliation by resorting to what an acquaintance described as an "inner emigration." He turned his attention to graphic design, and in 1939 he published an influential book, Die Kunst der Typographie (The Art of Typography). Ironically, two years later, the Nazis reversed their policy on typography, condemning Gothic typefaces as abominations promoted by Jewish printers, and proclaiming roman fonts to be the state-sanctioned letterform.